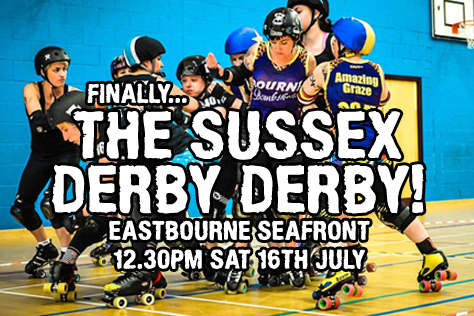 The first EVER Sussex roller derby derby (Brighton v Eastbourne) is TOMORROW and entry is FREE! Crikey! The two longest running Sussex roller derby leagues are finally playing a public game against each other. It takes place tomorrow (Saturday 16th July) and is going to be amazing for all kinds of reasons, not just that it’s the first time these leagues will meet in front of a baying crowd. The game is also OUTDOORS and on the SEAFRONT (in Eastbourne) with FREE admission. You can also – unlike that pesky Dolphin these days – bring in your own cans of beer. 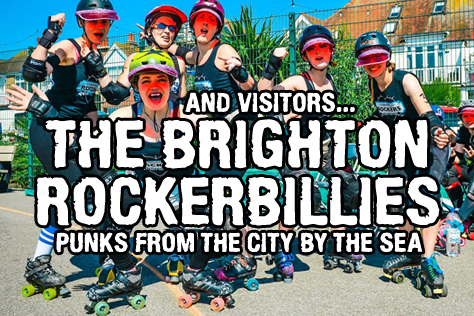 The game takes place tomorrow lunchtime (first whistle is at 12.30pm, so set your alarms) and pits Brighton’s B-team Rockerbillies against Eastbourne Roller Derby’s Bourne Bombshells. This HISTORIC match is part of Eastbourne Extreme’s weekend long outdoor roller derby tournament (the only such event in Europe) and we have full info – including interviews with both sides – below. The action takes place at the Fishermans Green Tennis Courts. That’s a mile along the coast heading North East from Eastbourne Pier – use the postcode BN22 7LH in maps apps. There’s car parking adjacent, it’s 25 minutes walk from Eastbourne train station (Southern trains aren’t as bad on weekends as they are during the week, so you should be able to get from B-town to Ebo in a little over 30 mins, fingers crossed) and several local buses stop nearby. Admission is totally free. As well as the roller derby, Extreme has roller hockey, skateboard/scooter ramps and lots of other extreme sports to check out. There are public toilets right by the derby area (expect long queues for the ladies at half time) and a few food outlets along the seafront. The nearest shop for booze and munchies is Spar on the corner of Beach Road and Seaside (about five mins walk). There are also after parties both evenings – a roller disco on the Saturday and pub takeover on the Sunday – if you fancy making a day/weekend of it. 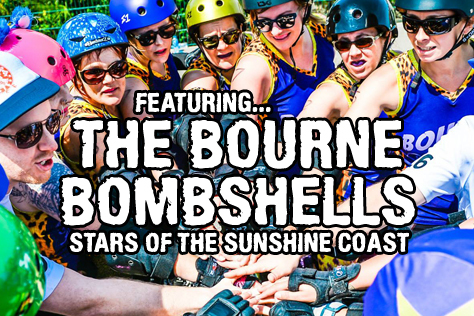 The Bombshells v Rockerbillies game runs from 12.30pm-2pm tomorrow, Saturday 16th, and several Brighton players (both A- and B-teamers) are taking part in various mixed games on the Sunday. In case any Brighton fans don’t know the Bombshells, briefly what’s your history? The Bourne Bombshells’ first bout was in March 2013 against Basingstoke Bullets. Before that we’d only had a few scrimmages. About half the team who played in that first bout are still bouting for the team and a few others are still with us as officials. And the history of roller derby at Eastbourne Extreme? Roller derby first appeared at Eastbourne Extreme in 2011 – there was an indoor scrimmage and a few jams outside as a demonstration (which I attempted to ref badly!). In 2012 the Bombshells ran a one-day tournament at Extreme. We didn’t take part as we weren’t bout-ready – most of the team hadn’t yet passed minimum skills. In 2013 we were ready to participate. That year we had a tournament on the Saturday for newer teams like ourselves, then one on the Sunday for more established sides. From there it’s grown every year. Now that we are Eastbourne Roller Derby we like to use Extreme as an opportunity for all of our different teams to play, which means it’s the biggest event in the ERD calendar. But we also have mixed team games – a whole day of them on Sunday this year – which give skaters from all over the country (and a few from the continent) an opportunity to skate at Extreme. How have the Bombshells themselves fared at past Extremes? We’ve tended to win half of our games at Extreme and lose half. We always make sure that we pick teams for Extreme that will give us a challenge and no one like to watch a blow out. This has resulted in some VERY close games – at last year’s Extreme we lost to Surrey Rollergirls by six points, then won against Big Bucks Rough Diamonds by eight points in an overtime jam! How different is playing derby outdoors to indoor derby? Any particular pros/cons? We’re used to it as we train outside in good weather for a few months before Extreme. There’s very little difference to playing indoors as the Extreme track is so smooth. Ploughing is a bit harder and toe stops wear down easily. Leggings are a wise choice. In 2012 one of the teams playing in the tournament arrived in hotpants with no leggings – they left some of their skin on the track! It can get windy on the seafront so that can be problematic too, and we do end up with a lot of people playing in sunglasses. Although both the Bombshells and Rockerbillies took part in last year’s tournament, you didn’t get to play each other. Are they a team that you know pretty well? I’d say we know the Brighton Rockers league pretty well in general (especially as I’m an ex-Brighton player). A lot of us attend their bouts regularly and quite a few of them have been to our scrimmages. Their B-team Rockerbillies have a few newer players on their roster that we’re not so familiar with, but there are a lot of skaters playing on Saturday who are well-known to us. Any particular players or tactics on either the Brighton or Eastbourne sides that people should look out for on Saturday? For Brighton, I’d say that Lab Wrath and Van Hayley are skaters to watch out for. I’ve seen both of them play a few times and they’re strong. We’ve also heard that the Rockerbillies have a transfer skater from Helsinki who is a good jammer. For the Bombshells, Beast and Smash’er Fierce are both great blockers who are very hard to get past. Bullet Bomber is a brilliant all-rounder. And Crash’s jamming has been on fire lately. As for tactics – I’m not telling! What are your expectations for the game and for the Extreme weekend as a whole? I don’t think we really have any expectations for the Bombshells v Rockerbillies game. For the Extreme weekend as a whole we expect sun and sunburn. Every year people underestimate the Eastbourne sun and get burned to a crisp. Bring factor 50 and a hat! Do the Bombshells have any plans for the rest of 2016 (and beyond) derby wise? We have a game in August against Oxford Wheels of Gory. And then in October we have a double header (the Bomb S’Quad are also playing) and we’ll be up against Wiltshire. We’ve also been looking into playing some teams in Northern France and we have a few games under discussion there. For any non-Brighton fans reading this, can you give us a brief history of the Rockerbillies? We’d all played together in scrims and mixed games, but I think our first game as the Rockerbillies was in May last year. We had to draft in a couple of A-teamers as we didn’t have enough people for a full roster, but the league has grown so much since then that we’re spoilt for choice now. There are a few of us from that original roster playing at Eastbourne Extreme, but a lot of the current Rockerbillies are newer additions. It’s really exciting and fantastic to see people starting out at our Fresh Meat sessions and just getting more and more confident as they move up to the B-team. You took part in last year’s Eastbourne Extreme tournament. What was that like? Last year’s Extreme was crazy! Three games in one day, all in the blazing sunshine. It was really tough and very intense, but it was a great experience. There were a few casualties but we all learnt a lot, and there was loads to see when we weren’t playing. There was just so much going on! I cracked one of my plates and ended up with some pretty funky tan lines, but it was really good fun. How different is playing derby outdoors to indoor derby? The tarmac is super grippy so it really favours fast, jukey jammers. It also chews through wheels and toe stops pretty quickly! I’ve heard some horror stories about tarmac-related injuries too, so it’s long leggings all the way for me. We all found our feet pretty quickly, though. I think you just get used to adapting to different kinds of floors at away games. Being outside in the sun by the sea beats being inside a leisure centre any day, even if we did all get a bit burnt last year. The Bombshells were also in that tournament last year, but you didn’t get to play against them. Are they a side you know pretty well? We love the Bombshells! We’ve played a lot of scrims and closed door games with them and it’s always great. They always give us a run for our money. They’re a really tough team, but they’re so much fun to skate with – we’re really lucky to have them so close by! They’re great to hang out with, too. We didn’t get to play them at Eastbourne Extreme last time because of the way the tournament format worked out, so we can’t wait for this year. Watch your backs Bombshells! Any particular players or tactics on either the Brighton or Eastbourne sides that people should look out for? Well we’re not going to give away our secrets now are we! I’ll just say we’ve got some up-and-coming rising stars on the team that I and the rest of the league are really excited about fielding. We definitely expect FUN all weekend. And of course it goes without saying that none of us will get a penalty and all our practised moves to go perfectly every time… And constant sun, of course. Do the Rockerbillies have any plans for the rest of 2016 (and beyond) derby wise? Damn, I need to check. I think we might have a double header coming up. Stay tuned!